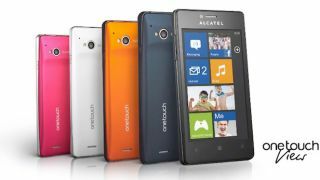 Alcatel's One Touch View - its Windows Phone 7.8-running handset bound for Russia - has been teased in a promotional video. Well, the phone makes an appearance right near the end, anyway. The rest of it is taken up with a character going by the name of Ricky, who tells us about his life. Which isn't that thrilling, admittedly, but does provide a glimpse of what we can expect from the One Touch View. The One Touch View looks like being one of the first handsets to come running the Windows Phone 7.8 operating system. It comes in a range of colours, much like Nokia's Lumia 920. On the specs front, it looks a little mid-range, but that's no bad thing. It packs a 4-inch, 800x480-pixel display, a 1GHz processor, and a 5-megapixel camera on the back. So it's not going to trouble the Samsung Galaxy S3 or HTC One X+, but then it's aimed at a different market. Microsoft will roll out Windows Phone 7.8 to handsets running Windows Phone 7.5. It brings some features from Windows Phone 8, such as resizable Live Tiles on the Start screen. So you don't have to miss out just because you haven't invested in a Windows Phone 8 mobile.